If you're like Alicia DiFabio--a minivan-driving, harried mother of four small children whose daily look features stained yoga pants, a messy ponytail, and a big diaper bag--you would shrug your shoulders and try to hold on for that after-bedtime glass of wine. It was to her utter surprise that this middle-aged, out-of-shape mother found herself on the starting line of a triathlon. Her memoir is both inspiring and informative as it explores the popularity, psychology, subculture, and transformative power of triathlons among "ordinary" women. 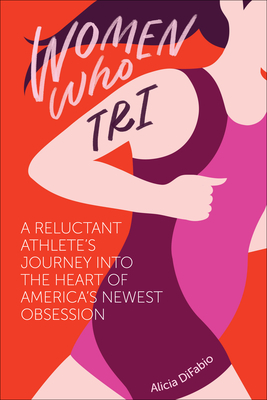 Set in a small New Jersey town that now hosts America's largest women-only triathlon club, Women Who Tri weaves together the insights of a psychologist, the research of a journalist, and the deep insecurities of a daunted newbie. DiFabio shares her journey from nervous newcomer to triathlon finisher as she investigates one of the world's most challenging and inspiring sports. She profiles women who have overcome challenges to become athletes and tri for themselves and to help others. Women Who Tri will entertain, enlighten, and inspire any triathlon enthusiast, from tri-addicts to the tri-curious. Alicia DiFabio, Psy.D. finished her first triathlon at age 45. She is a member of the 900-woman strong Mullica Hill Women's Tri Club and a member of its board of directors. DiFabio has a doctorate in Clinical Psychology from Loyola University Maryland. On hiatus from the practice of psychology to raise her four young children, she writes on health and wellness, women's issues, parenting, and education for newspapers, magazines, and literary journals. She is a contributing editor of the literary magazine, Pentimento. An active blogger, Dr. DiFabio chronicles her adventures as a special needs mother to four children, one who has been diagnosed with autism and epilepsy. Her blog, Lost in Holland, has been featured in the Examiner.com, a network serving over 20 million monthly readers and her posts have been picked up for syndication by McClatchy Tribune.